Body Mount Fill point box in white. - GAS IT Leisure Gas Bottles, Gas Cylincers and Gas Tanks - Catering, Motorhome, Campervan, Caravan, Farrier and Road Repair Refillable Gas Solutions. Body Mount Fill point box in white. The great, GAS IT 70mm Recessed fillpoint mounting box in solid White plastic is designed to take one of our fixed Brass Bayonet gas fillpoint It allows your gas systems fillpoint to be body mounted and allows simple filling by just removing the lid and inserting the gas fill gun directly on the fillpoint inside. 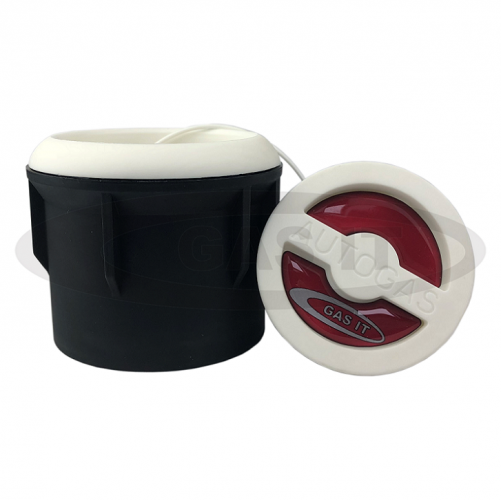 The lid comes with a retaining strap and the wording Autogas in the handle and includes the universal recognised red indicators in the lid that identifies a Leisure gas system when traveling in the UK or abroad. Installation is simple. All that is required is a 70mm hole is cut where you want to fit this and the fill box seperates and sandwiches the metal skin between the 2 parts. Fixing screws are provided. The fill box & lid is professionally painted in white, we do also list a solid Black plastic box version kit.Also in Black version which can be painted by yourselves with correct plastic paint to anybody colour.